Numark has announced that it‚Äôs shipping the first iPod DJ mixing console that lets you scratch, control pitch, key-lock, and simultaneously play two songs from a single iPod. If you’re interested in recording dj mixes or music shows, you can even use the iDJ to record back to your iPod. 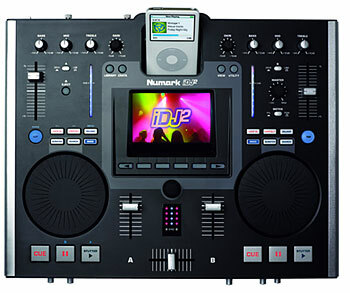 The Numark iDJ2 features an iPod docking system that lets you play two songs simultaneously from a single iPod, without the need for a computer. You can hook up multiple mass storage devices including additional iPods, thumb drives, and external USB hard drives through rear panel USB ports. In addition to USB connectivity with iPod docking and charging, the iDJ2 comes with line inputs for any audio source including a microphone, CD players and turntables. While the first generation of iPod mixers were glorified toys, the iDJ2 looks like it’s moving the category into new territory. You can manage your music library with visual track-profiling using the iDJ2‚Äôs graphic interface. The iDJ2 also lets you record musical performances to the iPod or any connected drive, in addition to offering full control audio play back. The¬†iDJ2 is available now with a a street price of $599. iDJ2 also comes with Numark‚Äôs exclusive Crate feature. The Crate is a unique feature that allows you to hold music you expect to play in a waiting list on the top performance level. Music can be placed into the Crate at anytime from search results, browse results, or playlists. Music in the crate can then be managed by sending it to decks or reordering on the fly. All of this has been designed to work seamlessly while playing songs. The Crate gets it‚Äôs name from the traditional function of a vinyl DJ‚Äôs record crate where DJs would often prop their records prior to placing on their decks. With Numark‚Äôs Crate feature, you can line up an entire Playlist, with the flexibility to swap songs or change their play order in seconds, without missing a beat. iDJ2 supports loading multiple file formats into the Crate including MP3, WAV, and AAC (non-DRM). A special iPod Direct Mode function allows users to play all iPod-supported music including songs purchased from the iTunes music store.